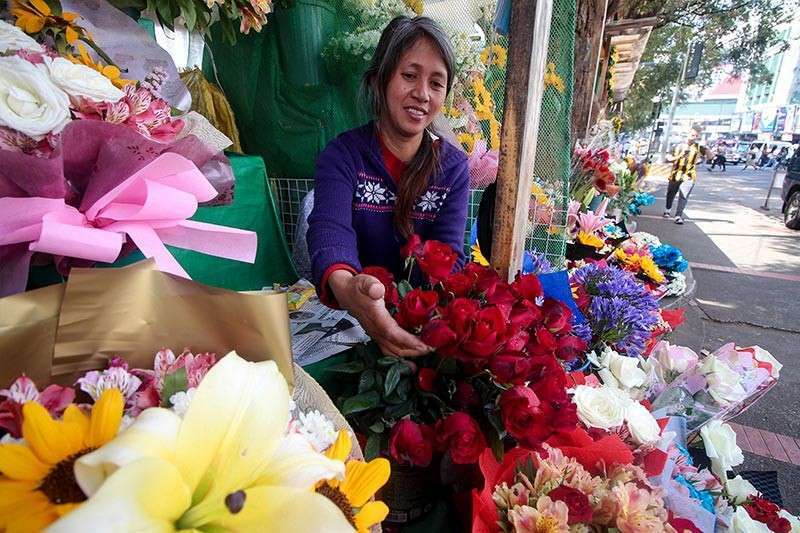 AS VALENTINE’S Day draws near, prices of cut flowers at the old market in Baguio City coming from Benguet towns have surged. Flower wholesaler Simona Zarate said prices of red roses (extra large) for this season are sold at P700 per bundle (two dozen) while pink and orange roses can be bought at P600, and white roses are retailed from P100 to P250 depending on the size while sunflowers are sold at P10 per stem. On regular days, red roses cost P300 per bundle. Andy Colte, president of the La Trinidad Cut flowers and Ornamental Growers Association (LatCOGA) in La Trinidad, Benguet assured there is enough supply of cut flowers because of the good weather. Although red roses are sold at P700 per bundle in flower shops along Kilometer 5, in La Trinidad, white roses are cheaper at P150 per bundle. Cristina Pacio, a farmer and retailer from Bineng said aside from roses, aster, radius, carnation are also in demand during the Valentine’s Day because they are also used as ornaments for flower arrangements. Aside from flowers, she added succulent plants and cactus are also used as gifts and tokens which cost P50 to P150, depending on the size. Benguet’s cut flowers are also distributed in the different markets such as Ilocos Sur, Tuegegarao, Abra, Metro Manila, Boracay and other provinces in the south.